Reach the loyal readers of our print editions, Mountain Valley Living Magazine, and NorCal Travel Guide. • Banner ad on our website – links to your website. 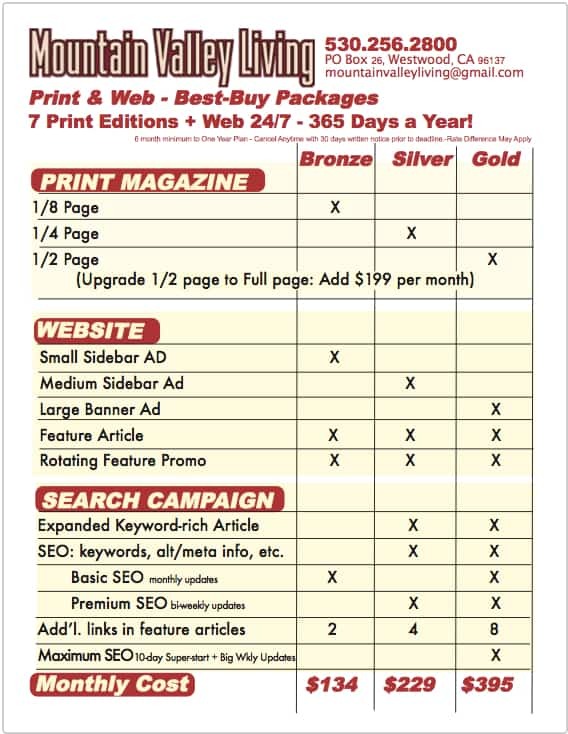 • Premium Organic Search Page includes expanded keyword-rich, online article, SEO, phone listing on google search pages, geo-targeted campaign, regular updates, and reporting by local MVL reps. • Links to your website or organic search page from front page of seasonal newsletters and/or websites (6 per year). • Links from 6 articles/features at MountainValleyLiving.com or other MVL signature website. ORGANIC CONTENT / ARTICLES / ADVERTORIALS – Print & Digital – Content to be used with advertorial style ads in magazine or online. Average 600 words. Links provided for sharing on your website, social media, emails, etc. No pre-written content without prior approval, subject to conditions. All content ©MVL. No copying allowed. Links may be shared.